The Mariners' "step back" resulted in several prospects arriving in Peoria who breathed life into a low-ranked minor league system. PEORIA, Ariz. — Over the past few springs, it had become a running joke among scouts and media as to just how weak the Mariners’ farm system had become. In the early part of Cactus League play, when the players projected for the 25-man roster weren’t playing every day or playing just a handful of innings, there was no reason to watch the innings filled by other players. “Why watch a bunch of veteran Quad-A guys on minor league deals that are roster fillers and a bunch ‘prospects’ that wouldn’t make our top 30?” one scout asked. While somewhat hyperbolic, it was still true. Those were the type of players filling out those innings in Cactus League games. They were not part of the present or the future. But it’s changed this spring with general manager Jerry Dipoto’s step-back plan. The trades of Robinson Cano, Jean Segura, Edwin Diaz, James Paxton and Mike Zunino netted a slew of young prospects that are hoped to be big-league players in the near future, including Justus Sheffield, Justin Dunn, Jake Fraley, Gerson Bautista, Dom Thompson-Williams and J.P. Crawford. If you add the invitations of in-house prospects Evan White and Kyle Lewis to their first big-league camp and the cameo appearances of Jarred Kelenic and Julio Rodriguez, well, the late innings of these spring games might actually be more interesting than the early innings. But these appearances in big-league camp and Cactus League games aren’t for fans or scouts. It’s about evaluating and developing these young players to make them ready to contribute in a year or two. But it goes beyond the games. It’s the daily work with proven MLB players. The players understand it’s a big opportunity. Braden Bishop enters his second big-league camp and understands how important it is to his development. It doesn’t lessen with time. Bishop can feel the difference late in games when he’s surrounded by players his age and younger, all with projections to be big leaguers for the Mariners. The Mariners scratched Mitch Haniger from the starting lineup just before first pitch of Sunday’s game. 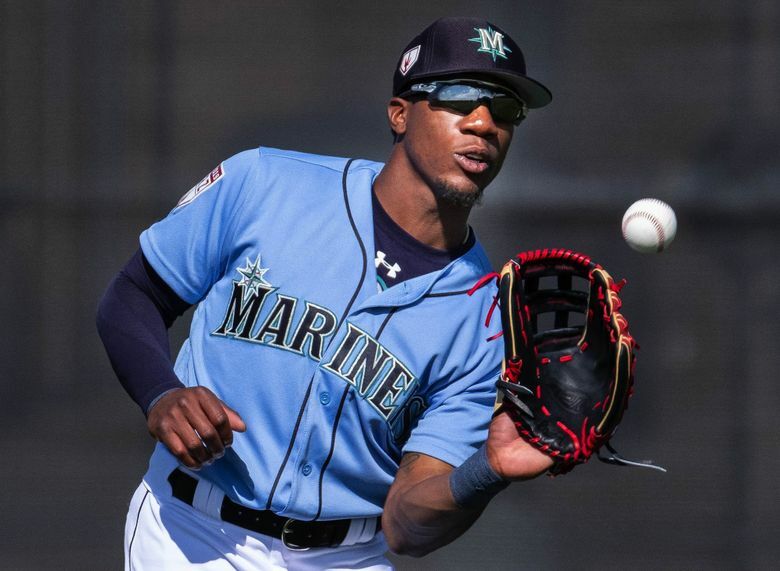 He was supposed to start in center field and bat second, but some back stiffness during the pregame workout became an issue and the Mariners didn’t want to make the situation worse. “We have the off day (Monday), so as soon as I heard that, it was just scratch him today,” Servais said. Shed Long was inserted into the starting lineup in the No. 2 spot in the batting order while playing left field. Jake Fraley, who was scheduled to start in left, moved to center. Haniger has had no issues with the back this spring. The Mariners have their first and only off day of their shortened spring training Monday. Servais has told players that he doesn’t want them coming to the complex for any reasons other than injury rehab. There will be no “B” games for pitchers to get work. Seattle will instead play a “B” game versus a team from Korea on Tuesday. A member of the Japanese media asked Servais if he was certain all the players would follow his edict and stay away from the complex. Servais smiled wryly, knowing the question was about Ichiro, who takes no days off. “OK, there may be one player that shows up tomorrow,” he said. On Saturday, the Mariners reassigned catcher Dean Nevarez to minor league camp. Nevarez appeared only in a B game during spring-training action. He earned an invite to big-league camp after winning the Mariners’ “productive team plate appearance” award as a member for the Arizona League Mariners. On Sunday, the Mariners optioned first baseman Joey Curletta to Class AAA Tacoma. An oblique injury sidelined him early in spring, and he never appeared in a Cactus League game. Curletta won the Ken Griffey Jr. minor league hitter of the year award and the Texas League MVP in 2018 with Class AA Arkansas. He is slated to start the season with the Rainiers.